This is the Superflex version of the Classic Filleting Knife from Marttiini. The INOX blade in the Superflex filleting knives is designed to be more flexible, making it easy for the filleting knife to follow the natural contours of the fish with less effort. As with any skill, practice makes perfect and these knives will help you develop great technique leading to perfect fillets time after time. 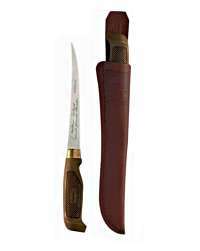 The Classic Superflex Filleting Knife from also features an improvement to the birch handle. Heat treatment of the birch adds a lovely deep colour to the wood and reduces the impact of moisture. 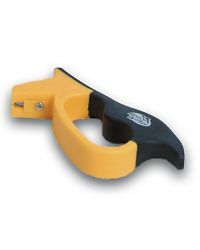 This together with the laser etched pattern and lightly waxed finish gives the handle plenty of grip, even with wet hands. The leather sheath that comes with the Classic Superflex is a rich brown colour and embossed with a traditional Finish design to create a really nice all round package that's great to own and use and makes a fantastic present for the trout angler who appreciates the nice things in life. These knives come in two blade lengths. The 6" blade is perfect for most trout and will also handle larger fish such as sea trout without much hassle. 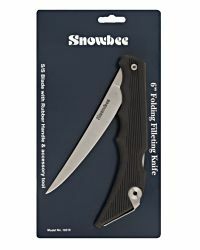 The 7.5" bladeClassic Superflex Filleting Knife will make an easier and neater job of large fish such as Salmon. The real wood used in these filleting knives is lightly waxed and easy to care for. To keep them in great condition it's best to handwash and dry these filleting knives after use rather than putting them in the dishwasher.